We made it, guys! The 50th anniversary special has come, kicked booty, and gone again. Join Deb, Erika, Liz, Lynne, and Tansy as we marvel at many things including the ways Doctor Who brings people together, the utter joy of seeing three Doctors on screen together for So Many Minutes, the genius of working in Billie Piper as not-Rose, the way Moffat “fixed” so many elements of classic and new Who, and, not least of all, the hilarity of seeing classic Doctors send themselves up beautifully. There’s more than enough love and joy and squee to go around! Liz lols at the trainwreck that was Doctor Who Live: The Afterparty! Tansy is made gleeful by the cameos in An Adventure in Space and Time! Loves Neil and Sue’s liveblogging at The Guardian! And enjoys the Doctor Who tweets from “legitimate” twitter accounts! Erika is going to see All the Whos in Whoville! Lynne indoctrinates friends with classic Doctor Who using Caves of Androzani and Horror of Fang Rock! And plays the awesome Doctor Who Google doodle! Deb loves Liz even more than before because she rage-ranked ALL the Doctor Who stories! And appreciates Tansy’s collection of links to her Who-50 posts! But I liked a lot of the rest! In hindsight I find the build up with Hurt as the ~super secret dark~ War Doctor a bit pointless cause HAVE YOU SEEN THIS GUY?!? HE WAS SO ADORABLE!!! lol He was just really a normal Doctor – and I loved all of his banter with Ten and Eleven (yeah, count my vote for the numbering staying the same – even Moffat says so)! Dear god he was cute!! ❤ Tom Baker's cameo was a nice touch as well! What a great episode, both yours and the show’s. You captured pretty much everything I loved about The Day Of The Doctor. The opening titles! UNIT in the tower of london! Robot crows! Fangirl scarf! etc. I particularly liked the lines “wheezing groaning sound” and “never cruel or cowardly, never give in, never give up”. All the scenes of the Doctors interacting was great, especially when they’re locked in the Tower, and Tennant’s Doctor can’t believe either Hurt or Smith. Most of the Emo Emo Waah The Time Waaaaaahr is just annoying, but in this they really pulled it off. Can’t wait to hear what you have to say about An Adventure In Space And Time, it was a total mash note to Verity Lambert. See (some of) you at Chicago TARDIS! I’m so glad I’m not the only one who started crying right from the beginning. I’m always the first to admit I’m a total emotional sap. I have all the feels all the time. This proved no different. We watched the first time at home with family/friends, and the second time in 3D at the theater. The second viewing just meant I knew when to start crying *earlier*. I tried to keep it under wraps so I wouldn’t spoil emotional stuff for the guy next to me, who hadn’t seen it yet. I don’t feel like the “return” of Gallifrey really upsets anything, because the way I see it, the Doctor(s) didn’t change/undo anything. Like they said, since it disappeared, everyone would assume it was destroyed. Who’s to say this isn’t what happened all along? You could finish watching the 50th, and start right up again with “Rose” and the 2005 series, and it still makes sense. Gallifrey is seemingly gone, at the Doctor’s own hand. I do totally get the complaint others have about it though, or that it cheapens the Doctor’s (and our own) sadness when we rewatch, since we can just say “oh it’s ok, they’re not really all dead!” But for me personally, it doesn’t cheapen it any more than Journey’s End cheapens the loss of Rose in Doomsday, or the awesomeness of Matt Smith cheapens the sadness of Tennant’s regeneration. But that’s just me. When I rewatch, I’m instantly transported back, and I can detach from knowing what’s to come. I can’t even get into everything I loved about the special, because it would be the longest comment ever. The 3 doctors interacted beautifully together. I liked finding out with happened with Elizabeth I. I thought Billie Piper as The Moment was brilliant. I was disappointed for about a second that it wasn’t actually Rose, but pre-Doomsday Rose would be difficult, and post JE Rose would be too many returns. Hurt’s regeneration, Tom Baker (omg! ), all the references for fans (I lol’ed at the “70s or 80s” UNIT dating comment from Kate), all 13(!) Doctors, fangirl Osgood with her knit-stitch scarf (I was just waiting for one of you to point that out! )… I’m obviously still a bit high on the whole weekend. I have to stop. It was wonderful. An Adventure in Space and Time was wonderful. The Fiveish Doctors was hysterical. What a great, great 50th. Ok, it was a too-long comment anyway. Oh well. The fez was in the museum because it had belonged to Albert Einstein. I loved the bit in Day of the Doctor when they are saving Gallifrey and Doctors go Geromino and Allons-Y and John Hurt is like ‘for God’s Sake, Gallifrey Stands’ That cracked me up. There was also a ‘reverse the polarity’ because well there had to be. Also in the five(ish) Doctors Davison, McCoy and Baker blocking the view of Barnaby Edwards and Nicholas Pegg when they get to the studio. Then locking in Nicholas Briggs and two others so they could be Daleks, and Briggs says ‘it’s their loss’ I was laughing hysterically throughout. The third ‘Dalek operator’ was David Troughton, I believe. I only found out recently that the awesome sarcastic receptionist in Five-ish is played by Niky Wardley, who played companion Tamsin in the Eighth Doctor Audio Adventures. What an anniversary – I feel like we got four specials – Night of the Doctor, An Adventure In Space and Time, The Five(ish) Doctors and the main event itself. So many kisses to the past it was like a theatre dressing room full of bouquets presented to the star on their gala night. How wonderful to have a show that hasn’t just squeaked through to its golden anniversary, but is confident and proud enough to set out its stall anew for the next 50 – re-telling its own story and pushing forward into the future refreshed? To make me feel as excited as I did when I was a child and getting lost with the man with the silly scarf. And then – while I’m still reeling from the flash of Capaldi’s eyes and the quiet goodbyes between the three Doctors – up pops the silly scarf man again and I dissolve into tears on the sofa. The 40 year-old man is the six year-old boy again, or maybe it’s the other way around. Who knows? What was it that the Doctor says at the end of The Big Bang? “We’re all just stories in the end.” That’s what the Curator was telling us really. It’s Tom looking at Matt looking back at Bill, and then to us with our nostalgia and to the kids behind the sofa looking forward to the next fifty, and the fifty beyond that again, and a universe of possibilities. What other show can possibly do that apart from this wonderful battered blue box of ours? Wow, Doctor Who. I just fell in love with you all over again. One other point – did anyone notice in the closing sequence that Delia Derbyshire finally got an on-screen credit for her work on the original theme? I think that’s the first time it’s ever happened – wonderful to see! Oh my gosh, you’re right, she finally got her name in the credits! This brings a small tear to my eye. I had wondered about that! I was pretty certain it hadn’t been done before, but wasn’t positive. Wonderful! Most of the comments have already expressed what I thought of “Day of the Doctor,” so instead I’d like to comment about what the day felt like to me. The local Whovian group met up at a shop to watch the anniversary. There was one showing at the simulcast time, one at the first BBCA repeat, and the last for the repeat at night. I chose to watch the simulcast at home, so I could react however I felt like, and not get in anyone else’s way. Once the simulcast was over I went to the shop. I was happy to find out that my friends liked the special, and I could talk about it with a few of them. I had planned to hang out at the shop after the first airing, and that’s what I did. It was so wonderful, being in the front of the store, and hearing the reactions from the main viewing room. As that final scene happened, I wandered back. It made me smile to see an older fan cover her mouth when Tom Baker’s voice sounded. It was great to hear the gasps, claps, and squeals when he appeared on screen. I found out later that there were about 70 people at the first showing, 50 at the second, and 30-40 at the third. That’s what felt so good to me, and why I want to comment. I can’t remember who, or maybe it was all of you, but someone expressed the joy of being able to share in the pleasure of the anniversary. That’s what I loved. Knowing that I wasn’t watching alone, even if I was at my house with no one else around. Knowing that I was (and am) enjoying something that lots of people are enjoying. Thank you for expressing that sentiment. This is a really nice comment. I like that you articulate that it’s OK to enjoy a group experience even if your are on your own. I’m so glad someone else loved the Five-ish Doctors. It was such a suprise and a treat and it kept me laughing the whole time. I loved everything about Day of the Doctor. It was wonderful to see Tom Baker on the show again. That was a long time coming. I loved the banter between ten and eleven. Or is it actually twelve and thirteen now. That’s too confusing. But for me the best part was the revelation the Doctor didn’t actually destroy Gallifrey. Although I do love the new show I’ve always had a bit of an issue with the idea that the Doctor could actually commit genocide, especially against his own race! He’s always been so anti violence. Yes, I know he is capable of violence but always as a last resort. I literally cheered when it turned out he’d merely hidden Gallifrey and not destroyed his home planet. And it sets up an interesting season ahead as the Doctor searches for his lost homeworld and what will happen when he finds it. Random note: One thing I have to admit that I really, really liked about ‘The Five(ish) Doctors Reboot’ (and trust me, I loved nearly every minute of it), was that Ty Tennant (Georgia’s son) even made an small appearance (he was the kid in the Doctor Who Experience with the sonic that comes upon the missing costumes and says ‘That’s not right’). I mean, yes, we had Colin’s kids and Peter’s kids, but as super-private as the Tennant family is, it was nice to see him take part (plus, he’s in his grandma’s stage school, so maybe we’ll see more of him on our screens in the future). Lovely! I’m so pleased that you all loved the anniversary special as much as I did. I’ve watched it about four times already and look forward to getting my grubby mitts on the Blu-ray soon. I was afraid that I’d feel let down, but I don’t. I was initially disappointed that Eccleston wasn’t going to be in it, but Moffat took what could have been a negative and turned it into an inspired positive by coming up with the notion of a missing Doctor and then casting John Hurt. I think what we got was actually more special that it would have been if we’d “just” had all three New Who Doctors on screen together, and it enabled him to muck about with the established lore of the show, which I LOVE. If there’s a “bible” for the show which can’t be changed then the show stagnates. It HAS to rei-invent itself every so often and what Moffat has done here is pure genius. I also hope we’ll get the Time Lords back because I always loved the idea that they were out there somewhere. The Last of the Time Lords thing was good while it lasted but it’s yesterday’s news now. Time to move on. So yes, I loved this and I can’t wait to see what happens at Christmas. Wheee!!! I’ve been surprised to hear some people who don’t seem to understand who Mad Tom is playing. It’s pretty clear to me that he’s a future Doctor who retires and becomes the Curator, and apparently he’ll have the ability to take on the appearance of previous incarnations. If he’s just some human curator, how could he know about Gallifrey, and the fact that it’s still out there somewhere? I was pretty clear on this at first as the lights came up in the theater. Then I heard so many people say how ambiguous they thought it was, that I started to second guess myself. I’m pleased to hear Tansy, Paul, and others state how clear it seemed to them. Having said that, I also have a theory that reference to the curator might be made when Moffat explains why Capaldi’s Doctor looks like Frobusher and Caecilius—which I believe we have been told he is going to explain. If Pertwee’s Doctor regenerated into Baker, and unconsciously based his regeneration on a human being he had met, then a human curator of the UNIT secret archives might be exactly what that human being would be doing in 2013 if he had been a UNIT scientist who reported to Liz Shaw in the early 1970s. I prefer the future Doctor scenario, but when I read the dialogue for that scene, I wonder if Tom and Matt weren’t given instructions from Moffat that the scene should read with some ambiguity. Moffat sometimes seems not to nail things down too firmly, as did RTD (e.g., was she the Doctor’s mom?). I have often thought that perhaps Time Lords don’t have real faces, they ONLY reflect those of others out there in the universe. Which explains the Abbott of Amboise and Salamander too – you don’t need to have met them to nick their face for a regeneration. It’s just – in the cloud. Actually deliberately choosing someone else’s face, of course, is a bit presumptuous, which is why the Doctor thought it strange when Romana did it. Randomness is the Time Lord Way! It also means that the Casanova referred to by Eleven in The Vampires of Venice could canonically be played by David Tennant. In the panel with Matt, Jenna, Steven Moffat and Nick Hurran they paused John Hurt’s regeneration right at the end and you can see Christopher Eccleston’s face, which I didn’t notice when watching it. Moffat also said that the next time the Doctor leaves the TARDIS after the regeneration is the start of ‘Rose’ and he thought the Doctor felt a connection with Rose straight away because of The Moment, which I quite like. What a great celebration for a great show, and thank you to all the wonderful Verities for making my 50th anniversary week (and year) so enjoyable! I enjoyed the Day of the Doctor so much more than I thought I would (well, feared I would – was so afraid I wouldn’t like it!) and agree with Erika that it really shows what Moffat can do at his best. And the fiveish doctors made me laugh so much! Peter Davison really can write terrific comedy. Every minute I was thinking ‘this is my favourite bit’, only for the next minute to be even funnier! (For the record, my current favourite bit was definitely Moffat playing with the action figures, and I have to admit I immediately thought of Liz because I find her love of the toys truly delightful). I still haven’t watched An Adventure in Space and Time – that pleasure is still waiting on the DVR for me, since I’ve been away for work this week. 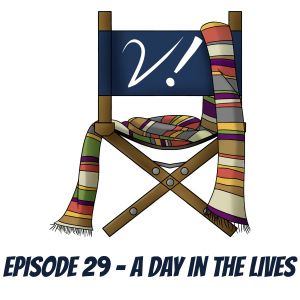 I listened to this Verity episode on the plane home and I’m sure I had a stupid grin on my face the whole way! It was super delightful to hear how happy and excited you all were. PS. My mother-in-law told me Tom Baker would be in it (not realising it was a spoiler, bless her! ), but I had genuinely forgotten until I heard his voice – I was just completely wrapped up in the story, and that’s the way Doctor Who should be!